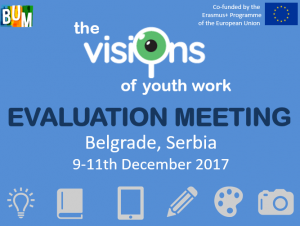 Evaluation meeting for the project The Visions of Youth Work was held in Belgrade from 9-11th of December. With our partners we went through the major achievements of the project, we shared lessons learned during the process, agreed about the finalization of dissemination activities and defined our next steps. The project team is highly satisfied with this project implementation and with its results achieved. We believe that the tool we produced for youth organizations willing to improve their communication and presentation of their work online is user-friendly and based on real youth work needs. In the future we expect it to be many times used for the purposes of improving the lives of young people and for communication about it in a good way through digital communication. Feed-back that we received from all parties involved in the project is proving our expectations to be real. Project The Visions of Youth Work is co-funded by the Erasmus+ programme of the European Union.